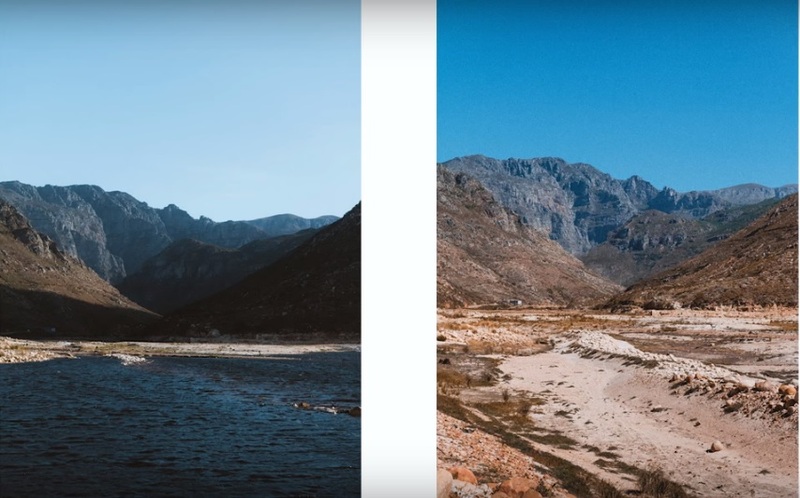 Before after shot of water crisis in Cape Town screen shot from visualrev video, see below. According to Cape Times, Cape Town has ramped up water restrictions which come into effect from 1 February. Residents will be allowed to use 50 litres per person per day - about two-and-a-half standard buckets - down from the current 87 litres allowed. This, as the city, continues to struggle with a three-year-long drought due to a lack of rains that traditionally filled catchment areas. According to Reuters, water levels at dams that supply South Africa’s Cape Town fell further this week, data showed on Wednesday. Dam levels in South Africa’s Western Cape province fell to 25.3 percent on Monday from 26.6 percent the previous week, and from nearly 40 percent a year ago, according to data from the department of water affairs. The water crisis poses a risk to a vibrant tourist industry that sees almost 2 million visitors flock to Cape Town every year. The drought has a devastating effect on South Africa wine harvest which is the 7th biggest in the world. Sadly the drought can be seen as it started in 2014 - satellite images show this clearly. City of Cape Town like South Africa is being held hostage by politics. A desalination water treatment plant large enough to service the entire Western Cape takes in average 2 years to build. 2014 - 2018 makes for 4 years of placing a city and its people hostage by local government.